I was reminded the other day of some words I penned to a group of grace-dwellers who sit around a table with me every now and again. I forgot I wrote them, to be honest, though I recognized the message when I looked again. 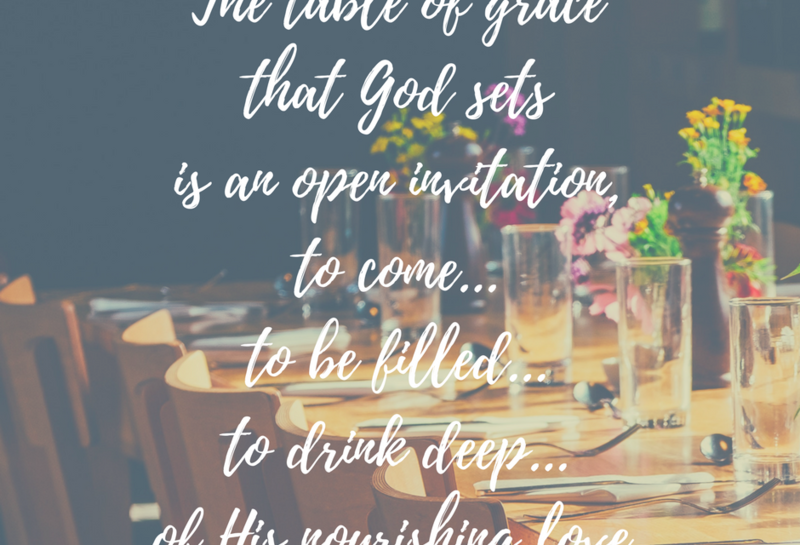 And I was reminded of the necessity to rest at the Table of Grace with the One who fills us repeatedly…because we get weary on the journey and we have amnesia when it comes to His goodness. Weariness feels like emptiness and longing to be filled and filled and filled by something more than our busyness because our soul is starved by the less than we consume at our temporary tables. And weariness can be found in many forms. Like an illness untreated and undetected, it wastes our energy and our time and our purpose because it steals what is meant to be a completing space in our soul. This waiting on God to meet our needs, rather than the voices and the words and the accolades and the meetings and the pats on the back and… all those things that we think will fill us up…is perhaps the most necessary resource we take in. 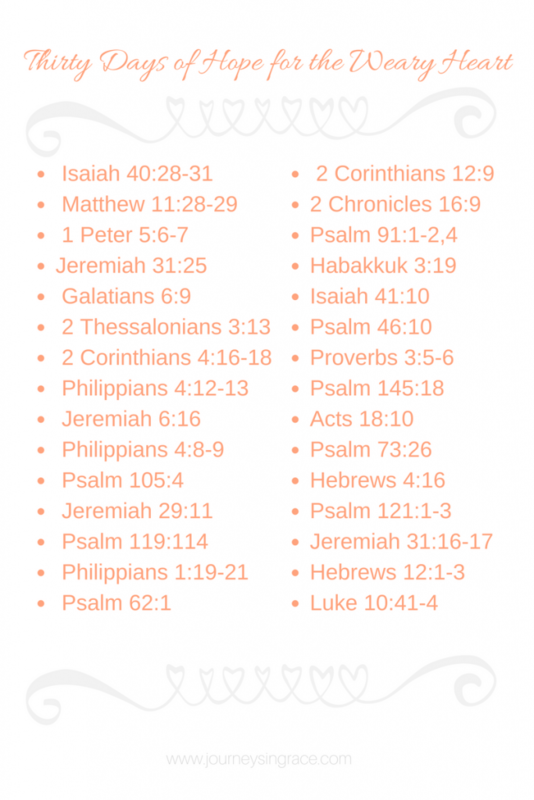 Are you weary today? Because there is a filling He has promised to replenish in our souls, a satiable fullness that is served in the most humble and profound way. And the source of this fullness has no end, because it is mined in the heart of the Father whose love for you is infinite. A fully satisfied soul is a nourished soul, tied only to the living source of love flowing from the heart of He who IS Love. It is saturated with a fullness that can’t be undone. It is an eternal quenching of a primal hunger we each were born with. Because we long to be filled by God at the table He has already set for us. The amplified version of Jeremiah 31:25 replaces the words ‘I will fully satisfy’ with ‘I have satiated’. To be satiated, is to be watered, filled to the full, overflowing. It’s to be saturated so much that whatever is poured in literally leaks, it spills over, out of the container. Matthew Poole, Bible commentator, describes a satiated soul as one which is ‘inebriated by the love of God.’ So I looked at a few of these words a little more closely, because if we understand that His purpose for feeding us His Living Word is to replenish and to send us, inebriated by His Love, to spill out the same grace and mercy as an answer to this weariness we wear… then we can serve it to others, as well. Satisfy/satiate comes from the Hebrew word ravah meaning full. Weary comes from the Hebrew word ayeph, meaning parched and faint of famished. Sorrowful comes from the Hebrew word daeb, meaning wasted away or languishing. Replenish comes from the Hebrew word mala, meaning to be filled. Though the curse of our toiling is very much a part of our present state, the promise of redemption, of being filled is not just for the future… it is for now as well. Psalm 23 reminds us that our cup will run over and surely goodness and mercy will follow us all the days of our life. The filling that satiates our souls can only come from connected fellowship to God. Even though our sin separates us from God, as we seek Him in truth ( Matt 6:33), He not only redeems our brokenness and removes the weights that pull us down, but he fills us FULL with what we have need of. He replenishes what we give up in our weariness with fullness…only God does this. Only God can make this exchange. Every weight, every burden, every care, every hurt is the offering we typically bring when we come to God. As we release them into His hands, we offer up our cups full of woe and in His faithfulness we are given a God-seed of grace in exchange. Yet the exchange has not been stilled as a one time transaction… it is consistently taking place. God is constantly filling our cup, overflowing with His goodness, all we have to do to quench the thirst and the hunger in our soul is to drink from what He offers. 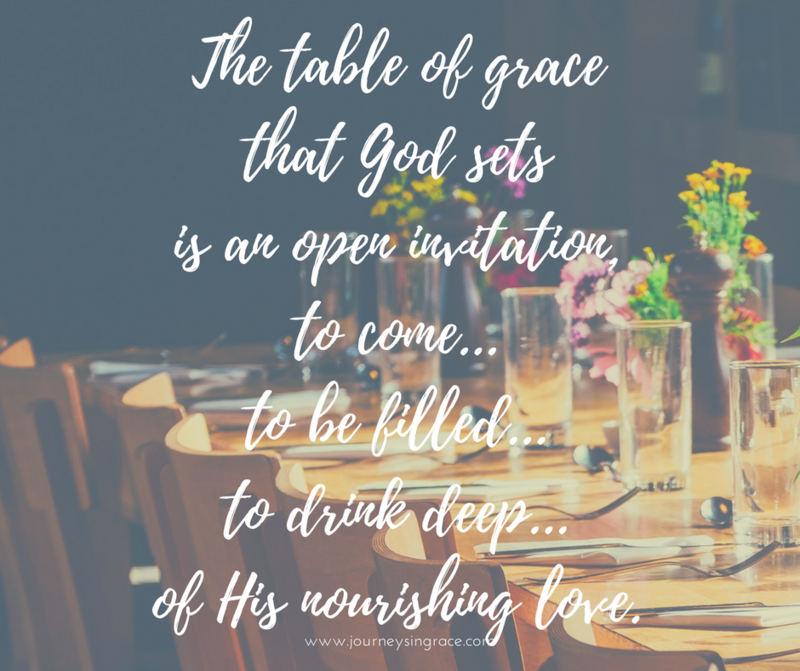 The Table of Grace He sets before us is always full and more than overflowing with the nourishment our souls and our bodies require for our journey. We learn, as the weariness departs and our hearts and heads are lifted, that thanksgiving, faith, and prayer are the courses He serves us. They become the fruit of our lips, and when we come and go from the communion table we are prepared to resist the burdens and serve grace. I love to feed people. 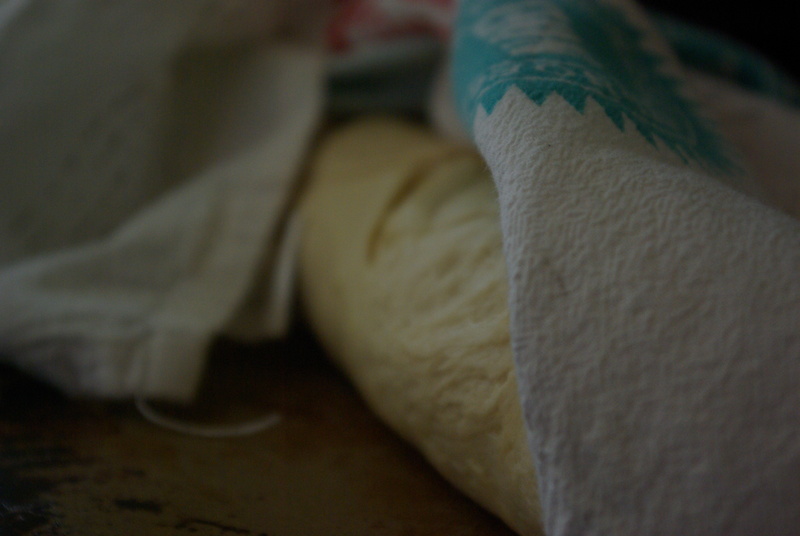 It’s a part of the legacy that’s been passed down to me from many hands who have beat flour and yeast and water together for generations. Worry tends to be passed down, too. We are often wearied in the ministrations of performing on this journey, hungry for something that will fill. We tend to consume the less than rather than the holy sacrament offered by the One familiar with sorrows. But there is an answer to our longing that keeps returning… a premise and a promise of what is to come. We need to sit ourselves down routinely at this table of grace. We need to settle and set our tables as an invitation to let God fill us up with His good. We need to set our tables with good things to feed the hungry and satiate the soul with the Word that is light and life and bread. We need to serve one another the word of God. This table thing is a holy calling we can no longer neglect to partake of, friends. It is the key to breaking the fast of His heart when the whole of the world barges in. As we fill up on the power-packed Presence of the Almighty, who is the One who supplies our every need we learn the rule of overflow. Being filled and spilled into by the Thirst-Quencher, being satiated and satisfied by the fullness of a meal of grace, we learn to dust off the worry and the weary crumbs that gather and repeat the process with others so they are filled, too. What are you hungry for? What are you thirsty for? righteousness, grace, salvation, knowledge of Christ, communion with Him…. We can only get more of God if we release the burdens that make us weary and come to the table He prepares. We can only be satiated by the life-filling water He gives if we lift our cups and take a drink of what He offers. We can only be strengthened by the manna of heaven as we take in His grace and partake of His mercy. Those who hunger for God will be filled. They will be poured into by the author of grace Himself as they wait under His mighty hand, emptied of cares and prepared for the possibility only God can see. Come to the table and be full of what He gives. If you find yourselves weary, take time to set your table of grace with some of His promises today. 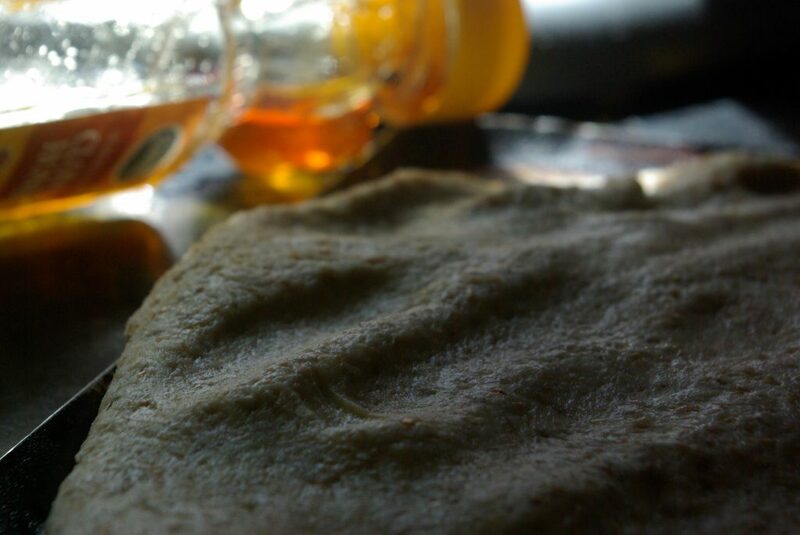 Mmm, I can smell the bread baking, Dawn! 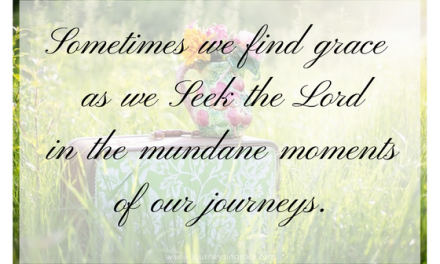 Glad to gather with you at the table of grace each week through your linkup! I’m so glad that God is not limited by us. “I am satiated.” That’s a beautiful tense. I need reminding of that, especially because of this: “we have amnesia when it comes to His goodness.” I want to remember more. Thanks, Dawn. 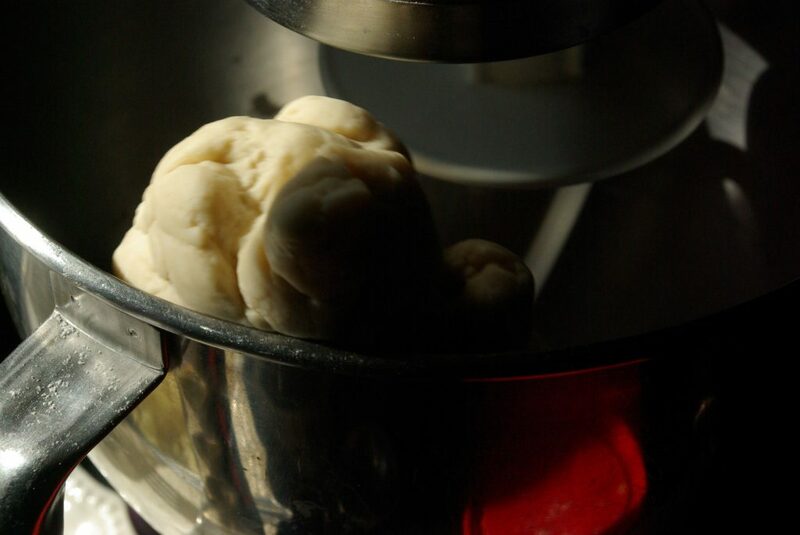 What struck me was that we intentionally pass on the good – baking bread but inadvertently pass on the bad – worry which is why we always need God’s grace. Dawn, I am blessed indeed by these words you have penned. A fully satisfied soul is a nourished soul, tied only to the living source of love flowing from the heart of He who IS Love. 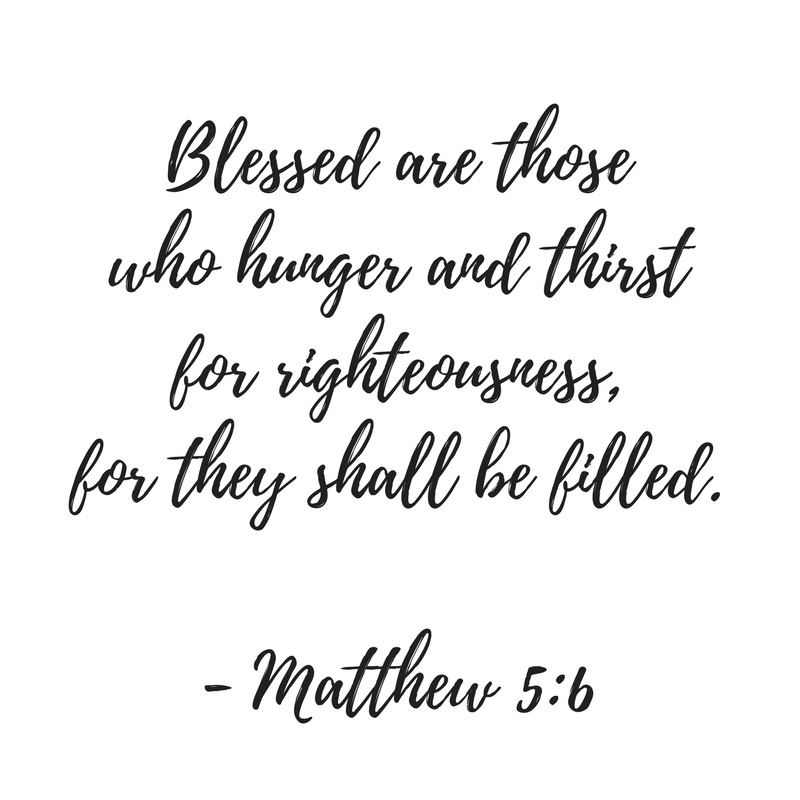 As you satisfy many hungry souls with living words of truth, may you also be filled to full satisfaction with alls much of His love as you can contain. I love the thought of being filled and filled with what God has to offer! 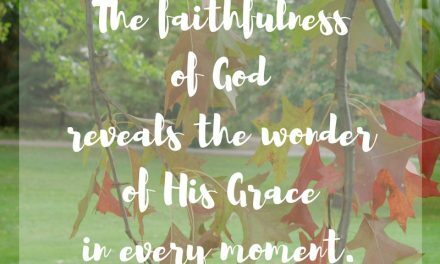 So many days I’m weary and I need to go to the Table of Grace and be filled to the brim of Him. “‘I will fully satisfy’ with ‘I have satiated’. To be satiated, is to be watered, filled to the full, overflowing.” LOVE!!! !